I had so much fun checking out the many apps available for preschool age children. Who knew there were so many apps available for little ones? As a mom of one child who is drawn to media, I have to say I’m really sad some of these apps weren’t available when my child was younger. I realize there’s some debate among parents about when to introduce media to children. If you are in the “my kids aren’t looking at a device until they are 8,” I respect that. This post isn’t written for you. This post is written for parents of preschool age children looking for quality, age-appropriate apps. The good news is there is a great selection of engaging, interactive apps available for iOS, Android, and Kindle! I can’t say enough about apps from Avokiddo! (I’ve included their apps on my Science and Spelling lists.) I knew, when I found one geared for preschool age children, it would be good. And, sure enough, Avokiddo didn’t disappoint! Beck and Bo is an educational app for preschool age kids. But just because kids are learning doesn’t mean they won’t be having fun. Like other apps from Avokiddo, Beck and Bo is engaging, creative, and entertaining. Kids are invited to build beautiful, animated scenes by dragging and dropping objects, animals, and props to their proper place; and, while they do that, they listen to their names and sounds, learning lots of vocabulary! Piece by piece, they bring to life 12 uniquely designed scenes. Each scene is colorful, full of sounds, animations, and fun interactive activities. Once all the objects have been correctly placed and tasks have been accomplished for a scene, kids gain access to an interactive album where they can view all the scene’s objects, listen to their sounds and names, and see how these words are spelled. There are no advertisements or in-app purchases. Have your preschoolers learn their ABCs by playing games! AlphaTots Alphabet is gamified flashcards. If you’re tempted to stop reading because I said the word flashcards, don’t. These games come with fun cartoon animations that your kids will be sure to love, with sounds to match. There are 26 interactive ABC puzzles and matching games, one for each letter of the alphabet. The letters are large and colorful, making them easy to read for preschool age children. They are presented in both upper case and lower case form. Another great feature of AlphaTots Alphabet is the ABC sing-along song. Interact with your preschooler by singing the ABCs with them, or see what they’ve learned by having them sing their ABCs alone. Get your child ready for reading success with Endless Alphabet. Preschoolers will love learning their ABCs and building vocabulary with this interactive app. Each word features a puzzle with talking letters and a short animation illustrating the definition. The adorable monsters make learning fun. What I love most about Endless Alphabet is the fact that it was designed specifically with young children in mind. There is no high score or sounds for failures. There are also no time limits which can cause stress for young children. Do note the free app comes with 7 word puzzles and animations. A one-time in-app purchase will unlock the additional 93 puzzles, giving your child a total of 100 words to explore and learn. Numbers and Addition Math Games will get your kids ready for school. Kids embark on a fun adventure in the savannah. Along the way, they learn key math skills such as counting, ordering numbers, and adding or subtracting while playing games with cute savannah animals! Numbers & Addition didn’t just make my best apps for math list, it’s won some notable awards as well. Monkey Preschool Lunchbox is a collection of 7 different games that teach preschool age kids about colors, letters, counting, differences, and matching. This app is available in 8 languages and has dozens of sounds and voice recordings for colors, letters, fruit names, and more. You can really customize this to fit the needs of your child, yet the app interface is a simple one, suited for preschool age children. There is no advertising, pop-up ads, or links to other sites. Thinkrolls is a clever game of logic. It’s an educational app that’s one part rolling ball platformer, one-part physics puzzler. Preschool age children gain fine-motor skills and grow in their ability to solve problems logically, all while having fun. The 104 easy and 103 harder levels gradually build upon each other. There’s no failure here. As kids try different combinations to clear a path through the maze, they intuitively learn through trial and error what works. Kids must plan out their moves in advance, use precise timing, and rely on their memory to reunite their Thinkroll buddies. The design and artwork for Thinkrolls has been cleverly crafted for young learners. It provides a challenge that’s engaging and enjoyable. Thinkrolls is COPPA compliant. It has no ads and no in-app billing. Montessori Crosswords helps kids develop reading, writing, and spelling skills by dragging and dropping letters into a crossword grid to form words that correspond to the given pictures. Preschool age children gain fine-motor skills as they drag letters around in the movable alphabet and practice linking phonetic sounds to letters. They are introduced to simple words with one sound. Children can go on to expand their vocabularies in levels 2-4. These levels offer words that contain more complex phonics. Here kids learn long vowel sounds or blends. These levels also offer the option to automatically create multi-word crosswords in tens of thousands of different combinations. The app contains a database of over 300 words and their corresponding pictures. There are thousands of possible crosswords. Montessori Crosswords includes sounds, animations, and interactive visual effects that are displayed after a word is completed. The movable alphabet engages kids. It’s learning that feels like play! Oh how I wish Writing Wizard was available when my son was in preschool. I would have saved a fortune on shaving cream (and that sensory table we used for letter practice couldn’t be transported everywhere). Not to mention, many days we had a huge mess to clean up. I’m not saying get rid of sensory tables, but this is a great app to add to your handy bag of learning options. What I love most about Writing Wizard is that it is customizable. You can tailor it to fit the needs of your child. You can even add your own word lists. You can see how your child is progressing because there is a detailed report with information on what your child has done, including the ability to replay and export the tracings to view your child’s progress. Once your child begins to gain skills, you can set the app for 5-Stars play mode. Worried that your child’s fine-motor skills won’t translate to paper? Create PDF worksheets from your word lists when it’s time to practice on real paper. You can directly print them from the app or email them. I rarely include videos in my reviews. But, I’m doing so here because I really feel this is a must-see-to-believe case. There are no 3rd party ads. Gus on the Go is a great option for those looking for a language option for preschool age children. There are currently 28 language options available! All of them make learning fun for kids. They’ll love joining Gus, the friendly owl, as he travels around the world and explores languages from every corner of the globe! All versions feature adorable animations and fun exercises. Children (and parents) learn basic vocabulary concepts with interactive visual and auditory lessons on numbers, colors, shapes, and more. Each lesson review unlocks an exciting vocabulary game that reinforces what your child previously learned. Be sure to visit their website. They have free language printables and great blog posts with ideas for raising multilingual kids. Instead of linking to just one of the language versions below, I’m linking to the page which shows all of them for each platform. All versions of Gus on the Go are kid-friendly. They do NOT contain ads, in-app purchases, links, tracking, or sharing functions. Starfall ABCs is an alphabet-teaching app that is perfect for toddlers and preschoolers. Your child can choose a letter from the main menu and watch it make a fun entrance based on its sound. Each letter has a variety of educational activities associated with it, from fun visuals and sounds to entertaining ways to use the letter in words and sentences. The exciting games reinforce letter sounds by asking which letter doesn’t belong or matching capital and lowercase letters together. Your child can also interact with each letter by placing the alphabet together in order or filling in letters to form words. Your preschooler will have fun establishing early math skills in a fairy tale setting with this cute, science-backed app. In each of the four magical levels, your preschooler will be asked to choose between two groups of items with a different number in each group. The fun graphics and magical theme will keep your youngster entertained while also giving them time to practice counting and estimating groups of objects. You will probably need to assist your child when they begin playing since there are no audio instructions and there is a clear task at hand and a right or wrong choice for each option. 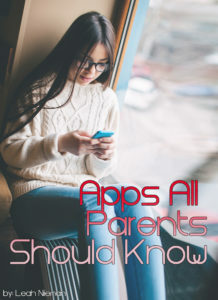 This expansive app also includes short videos for parents to give you ideas on how to extend the lessons in the app to offline learning opportunities. WHAT ARE SOME OF YOUR PRESCHOOLER’S FAVORITE APPS?